You Oughta Know is the tune that broke it wide open for singer Alanis Morissette. A gutsy, no-holds-barred collaboration from the unstoppable team of singer Morissette and producer Glen Ballard, it was culled as the first single from the monstrously successful 1995 debut album, Jagged Little Pill – and she hasn’t looked back since. In fact, You Oughta Know is currently enjoying even more success these days as the flip side of the Top Ten Morissette entry, “You Learn.” In any event, You Oughta Know remains one of the power-pop diva’s most acerbic and unflinching releases to date. Bristling with emotion, top notch production, well-layered instrumental arranging, and some unexpected retro guitar touches, it is made even more significant by the presence and contributions of Red Hot Chili Peppers bassist and guitarist, Flea and Dave Navarro, on the track. Gtr. 1 is processed with an electronic tremo­lo effect, which produces the distinctive quiver­ing sound featured prominently in the song. At one time in rock history, tremolo was a standard effect built into many amps of the 50s and 60s – like the Fender Deluxe and Vibroverb, various Gibsons and Ampegs, and the Vox AC-30. It was discontinued by the 80s, regained popularity in the retro-conscious 90s, and is available cur­rently in reissue amps and stomp boxes like the Dunlop Tremolo Pan. The tremolo sound adds much to the nervous, sinister impression of You Oughta Know, providing a splendid example of how to musically color a song’s intent with effects use. Tremolo typically has two con­trols: speed and intensity. In You Oughta Know, the speed is set for a 16th-note pulsation (most evident in the sustain chords of the inter­lude) while the intensity is about half way up, which places it nicely in the track. The verse progression of You Oughta Know is made of arpeggiated triads and partial barre chords. Partial barre chords are smaller barred chords that cover three or four strings at a time with a single finger, usually the index. In the verses, these form the underlying shapes for the F#m7 and B/F# chords of the progression [Fig. 1]. Melody notes are added above the par­tial barres to produce jangling momentary voicings like F#m6 and B7sus4. In the pre-chorus, the partial barre shapes are elaborated on with more added melody notes. At a glance, these can be seen as partial scales on the top two strings over the four-note partial barre chords on strings 1 – 4 [Fig. 2]. The melody notes are played with third and fourth fingers on the F#m7 shape and with the second and fourth fingers on the B shape. A second gui­tar (Gtr. 2) with a distorted tone playing steady 16ths, enters in the pre-chorus to thicken the arrangement, add more texture and instrumen­tal contrast, and push toward the inevitable heavy chorus. The chorus revolves around a four-chord progression: F#, E, A, and B (Rhy. Figs. 2 and 2A) stated by Gtrs. 1 and 2. It is made primarily of basic barre chords and open chords. The fourth chord in the Gtr. 1 progression, however, is unusual. The requires a double-barre technique. Note that the index finger barres the 6th and 5th strings while the 4th, 3rd and 2nd strings are barred with the third or fourth finger [Fig. 3]. It is advisable to anticipate the next chord in the progression, F#, by keeping the index finger positioned on the 6th string for both chords as a common fretted tone [Fig. 4]. 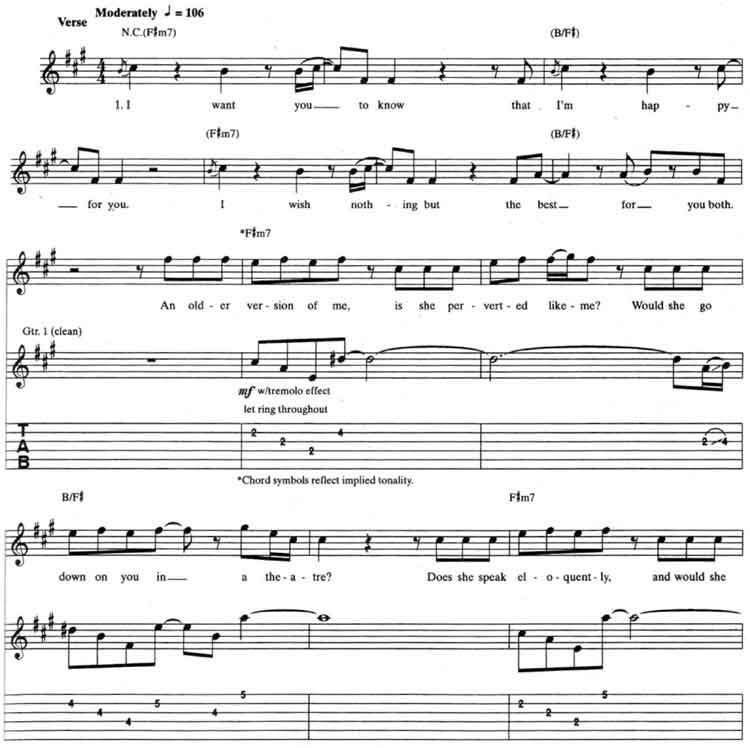 It’s a part of Alanis Morissette You Oughta Know guitar tab and sheet. Brilliant stuff !! You have a follower !! © 2012 - 2019 TabsClub Powered by TabsClub 42 queries in 0.392 seconds.